Welcome to Glass Accessories, website of Fulgent World company dedicated only to crystal glass nail files this company produces and exports. We have a great assortment of crystal glass nail files, decorated and plain, including: colored, hand painted, silk printed, decorated with crystals. High quality and only Czech tempered glass and Bohemian crystal, within unique painting desingns make an outstanging crystal glass nail files we offer you. Please see appropriate pages, to find out more and see photos. 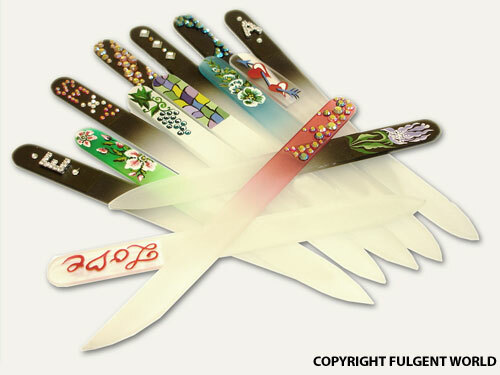 To buy glass nail files wholesale contact us by email.